According to the "History of Atlantic, 1868-1968" published by the Atlantic Chamber of Commerce for the Atlantic Centennial (pg. 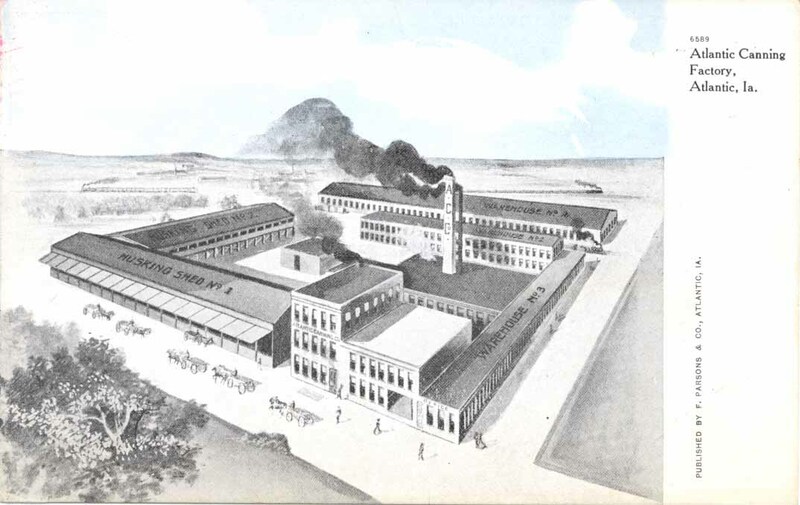 50), "The Atlantic Canning factory was built in 1882 by Messrs. S. F. Martin, J. A. McWaid and R. D. Wilkin. It shortly became a leading industry employing 75 to 100 workers in season." "J. W. Cuykendall bought half interest in the firm in 1897 and later bought out his partners. The present Walnut Grove plant number 2 is the old canning factory. 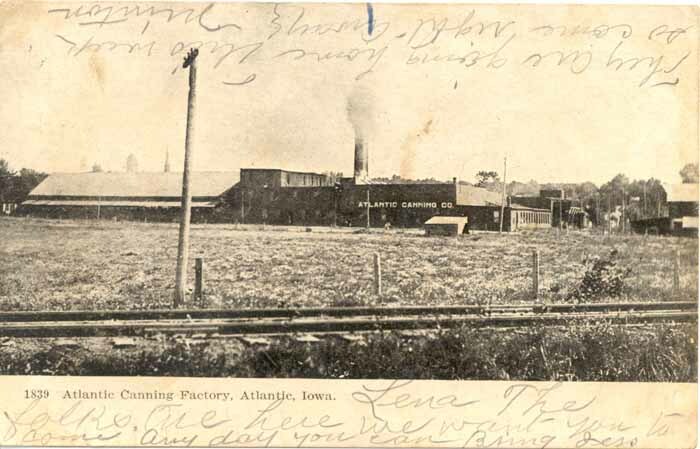 For many years the plant was a source of extra seasonal income for many Atlantic families as well as a source of income for area farmers with whom the factory would contract each year for sweet corn. During the season it was a busy place . . . The production of canned corn and pumpkin ran into the hundreds of thousands of cans a season and at one time it was claimed that the factory was the largest of its kind in the world. The factory went through one serious fire and was rebuilt on a slightly smaller scale. With the coming of frozen foods, the canning industry gradually declined, and with it the local factory. A group of local business men took it over at the last and attempted to keep it operating with the canning of beans. This move failed and eventually the plant was bought by the Walnut Grove Products, which still uses it." The photo postcard above was postmarked in 1908 and addressed to Miss Lena McMahan in rural Tennessee. Handwritten message reads, "Lena, The folks are here. We want you to come any day you can. Bring Jess. They are going home this week so come right away. Minton." 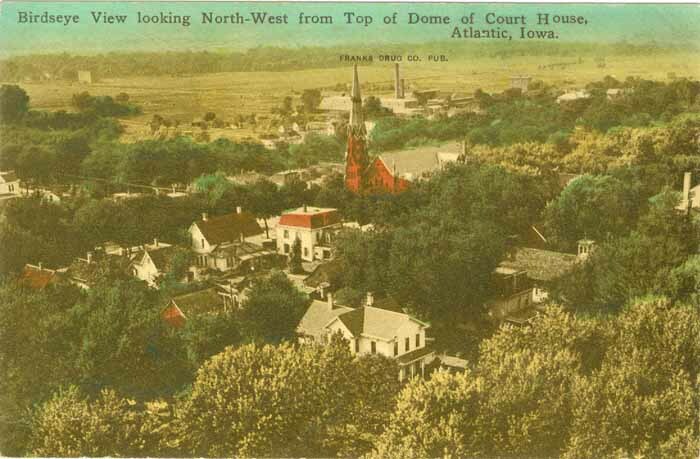 Below, an undated postcard birdseye view from the courthouse dome looking northwest. 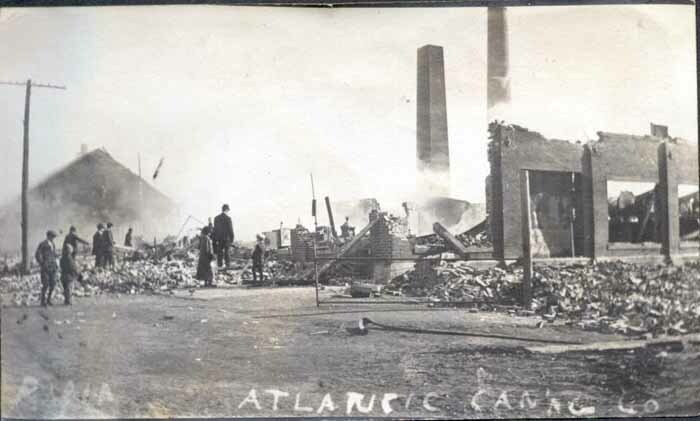 This undated photo is labelled "Atlantic Canning Co." It was most likely taken after the "serious fire" mentioned above. The photo was pasted in an album belonging to Christine (Anderson) Petersen, and was found among other photos taken circa 1900-1915. Photos contributed by Cheryl Siebrass, May 2010, October 2011 and September 2014.